Jean Bart was a French battleship of World War II, named for the 17th-century seaman, privateer, and corsair Jean Bart. She was the second Richelieu-class battleship. Derived from the Dunkerque class, Jean Bart and her sister ship Richelieu were designed to fight the new battleships of the Italian Navy. Their speed, shielding, armament, and overall technology were state of the art, but they had a rather unusual main battery armament arrangement, with two 4-gun turrets forward and none aft. Jean Bart was incomplete when France surrendered to Germany in June 1940. She sailed from Saint-Nazaire to Casablanca just before the Armistice. She was sunk in harbour in 1942. After the war she was re-floated, completed with an updated anti-aircraft battery, and entered service in 1955. She had a very short career: Jean Bart was put into reserve in 1957, decommissioned in 1961, and scrapped in 1969. 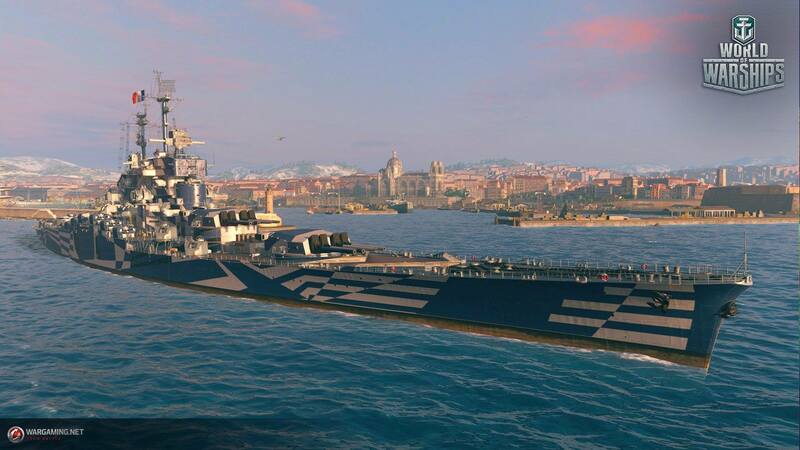 Jean Bart will be a Tier VIII Premium battleship in World of Warships and the following stats are listed without crew and upgrade modifiers but with best available modules. The stats are subject to change during the testing. Detectability after firing main guns in smoke: 15.0 km. Main goal of the new consumable get a chance for ship’s owner boost for a small period of time reload main guns and fire a final salvo. Great ! Exactly the ship I was looking for !